There are several things to be aware of with Champagne bottles. First of all, a standard Champagne bottle, which is 750ml, the same as a regular bottle of wine, is traditionally larger in shape. Although different Champagne bottles have somewhat different shapes, they all have thick walls, sloping shoulders, a pronounced punt or bottom depression, and usually are wider than a normal bottle of wine. This can be annoying because if you're trying to store and perhaps age Champagne, the bottles won't fit in normal wine racks or standalone wine storage/cellar units. I store my Champagne in magnum racks, which fit all Champagne bottles with ease. Besides the standard 750ml bottle, Champagne, just like other wines, come in various sized bottles. Champagne splits are 187ml or one quarter sized bottles. This is one largish glass or two small glasses. Although a neat idea, you won't find much choice, although a few decent Champagnes are available including Pommery, Perrier-Jouët, and Nicolas Feuillatte. Half bottles (sometimes mistakenly called splits) are a wonderful idea as two people can have a glass before dinner or perhaps just because. There are many more choices available than for splits, including, Krug, Billecart Salmon, Pommery, Perrier-Jouët, Ruinart, Roederer, Laurent Perrier, Heidsieck, and Nicolas Feuillatte. It's often had to find a decent selection of half bottles of any wine locally. Merchants will tell you that although people often request them, they rarely buy them. I don't suggest aging Champagne in splits or half bottles. Larger bottles simply age better, especially magnums. A standard bottle is 750ml, and although shapes very widely, all Champagne (to the best of my knowledge) come in 750s. A great size to share with 2 to 3 people, or for a single glass among 5 or even 6 if you stretch it a little. Champagne magnums, actaully all magnums, are double bottles, and magnums are great! Not only are they lots of fun, but for 3 or more people the size is about right, especially if you are having Champagne with dinner or at a party. In addition, Champagne in magnums ages better. It ages more slowly, and becomes more complex and nuanced than in a regular sized bottle. Jeroboams, also known as double magnums, which are 3 Liters, the have a capacity of 4 normal bottles. Jeroboam was the first king of Northern Kingdom of Israel somewhere around 910BC. 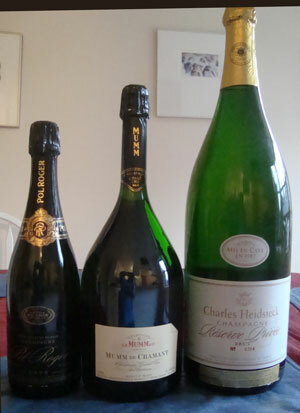 In the picture, from right to left, a standard 750 ml bottle, a magnum, and a Jeroboam. Rehoboams are 4.5 liters, the capacity of 6 normal bottles. Rehoboam was an old tax happy king around the same time of Jeroboam. Methuselahs are 6.0 liters, the capacity of 8 normal bottles, and are named after the oldest man in the Bible. Maybe his wine consumption had something to do with his longevity? Salmanazars are 9.0 liter bottles, the capacity of 12 normal bottles, named after a Assyrian King. Presumably he drank a lot or at least threw lots of parties. Balthazars are 12.0 liter bottles, the capacity of 16 normal bottles, named after one of the wise man. Many wise men drink lots of Champagne (as well as a few fools). Nebuchadnezzars are 15.0 liter bottles, and damn big - 20 normal bottles. King Chad, as his subjects reportedly called him, was the ruler of Babylon. His drinking habits are unknown but it's been rumored he was an early Rastafarian. Yes, bigger bottles exist, but you'll rarely run into Melchiors (18 liters) or Solomons (20 liters) or Melchizedeks (30 liters). If you do, and they're full of something good, please contact me before opening! Note: A 30 liter Melchizedek of Armand de Brignac Champagne sold for $100,000 recently in Las Vegas recently.